One time I was commuting to work on the J-church at the busy time of 7:40am. This woman gets on wearing a camping backpack that is not only packed to capacity but she also had random crap in the outer pockets like 2 large water bottles. I had a seat by the aisle and was unlucky since she decided to park herself in the aisle right next to me. 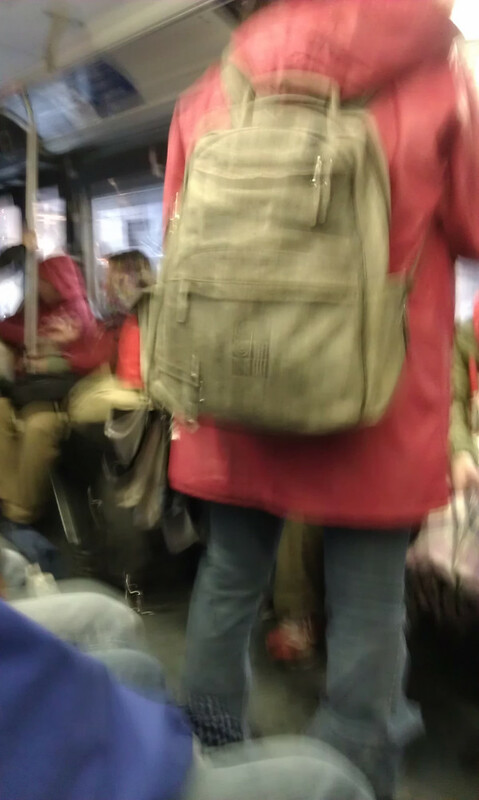 Although there were no available seats, she had room in the aisle to take off her backpack. Not only did she keep it on, she also was a pole hugger, using two hands and pressing her body against the pole so that no one else could use it. 2 strikes right there. The comedy happened when she turned quickly to look out the window on the opposite side and her backpack nearly hit me directly in the face. Luckily, I saw it coming and my seat mate and I bent backwards ala Neo in the Matrix and it flew above my face, missing my nose by a centimeter. We both let out a yell and she didn’t notice. Headphones on full blast, of course, she was oblivious. So she turned BACK around and again we ducked just in time. Everyone else was laughing and/or shaking their heads at the ridiculousness of the situation. Her pack kept bumping against the side of my head and other people all the way from Dolores Park to Embarcadero. Someone told her she should take off her pack but she either didn’t hear it or ignored them. At least it wasn’t a boring commute, channeling all my hate in her direction was an effective distraction.